Northside developer James Hoy is gaining a reputation for having some of the most creative, unique house renovations around. His latest project on 604 Middle St. in Historic Deutschtown is no different, mimicking the style of a turn of the century train station. A $20 million redevelopment project centered around the renovation of the former ARC House building on Pittsburgh’s North Side will result in a new 120-key Comfort Inn by Choice hotel, a 300-space parking garage and a 36-unit apartment building. A New Zealand transplant to Pittsburgh is working to transform an historic church on the North Side into a new arts center. Two of Pittsburgh's major apartment complexes built in the 1960s are undergoing multimillion-dollar renovations by their new owner, Faros Properties of New York. 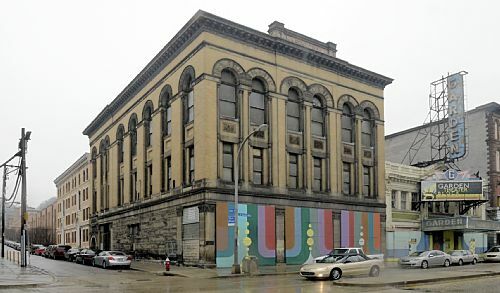 The Urban Redevelopment Authority of Pittsburgh tweaked its financing for a plan to renovate the vacant Masonic Temple building on West North Avenue in the North Side into apartments and a space for the nonprofit City of Asylum. Residents on the Northside may soon feel as if they are taking a journey back in time when they walk through the Deutschtown neighborhood. The Pittsburgh Urban Redevelopment Authority is seeking new housing for a cleared 4.6-acre site in the North Side neighborhood of Brighton Heights. The restoration of the Garden Theater and Masonic Temple Building is set to be complete this fall – and local business owners are eager to move in. Continental Real Estate Cos. is in the early stages of planning its next project on the North Shore, a multi-family development on an acre of land adjacent to the Equitable building. The Pittsburgh Urban Redevelopment Authority formally issued a request for proposals on Monday, April 21, to developers interested in redeveloping two leftover properties in the Garden Theater block located in the heart of the North Side. As soon as weather permits, phase three of Columbus Square will be underway, with two of the five homes to be built already reserved. Manchester Citizens Corporation is continuing to build positive momentum in a formerly troubled corridor with the redevelopment on two key buildings on Columbus Avenue. Despite the rot, dirt and mold, when New Yorker Sarah Sims Erwin stepped into the row homes at 406 and 408 Foreland Ave., she knew it was the place for her. A plan to improve the safety and aesthetic appeal of the gateway to Spring Garden and East Deutschtown has evolved to a master plan for the two Northside neighborhoods. The Northview Family Center looks closed. It’s tucked away in the woods on Hazlett Street on an overgrown lot, and the building’s entrance shrouded by a rusty awning. Together with a group of leaders from across the Northside, the family center plans to improve the exterior of the building in the hopes that it will draw more people to the programs hosted there. Neighbors, businesses and the city came together this summer to clear the lots at 707-709 James Street and make room for a brand new community garden in a space that was once an eyesore. Northsiders can expect to see progress on The Garden Theater Block by the end of the summer said developers at Zukin Realty. The Fineview Citizen’s Council is continuing its efforts to build new homes in the hilltop neighborhood, which they hope will attract young families. The current phase of six new townhomes brings to a close the five-year project. All of the new homes are under contract with buyers. Andy Haines of S&A Homes says his company receives continuous calls of interest for Federal Hill. The Brightwood Civic Group, The Northside Community Development Fund, Rivers Casino and The Northside Leadership Conference celebrated the complete renovation of 1324 and 1407 WooA plan to improve the safety and aesthetic appeal of the gateway to Spring Garden and East Deutschtown has evolved to a master plan for the two Northside neighborhoods.dland Avenue in Brightwood Thursday March 24. A nonprofit that houses and supports writers who are persecuted in their native countries plans to open a literary center in three storefronts in the former Masonic Temple on North Avenue. Northside row houses are classic creatures of the 19th century, yet they are finding a home in the 21st. Money for repairs came from facade renovation programs operated by Pittsburgh's Urban Redevelopment Authority to erase vacant and dilapidated homes and storefronts, including 431 and 433 E. Ohio St. plus 1108 Federal Street. Brightwood Civic Groups continued progress on their initiative to purchase and rehab vacant and dilapidated houses on Woodland Avenue in 2013 with the completion of a new home. The three-bedroom home was renovated this fall, and the buyers benefited from a 10-year tax abatement deal. Rows of sunflowers and blueberry plants contribute to community garders on Perry South's Charles and Burgess Streets. Many Allegheny West residents love their North Side neighborhood's Victorian-era architecture. Mike Ramsey's taste, however, runs more toward fire and rock than lace curtains and clawfoot tubs. Pittsburgh's Historic Review Commission approved an expansion of the Mexican War Streets which would more than double the roughly nine square blocks designated by the city in 1972. A Columbus, Ohio, developer, confident about the demand for space on the North Shore, is expanding a proposed office and retail development next to Stage AE to include a third floor. The Northside Leadership Conference and the Historic Deutschtown Development Corporation marked the start of the Deutschtown Gateway Project with a nail pounding ceremony on the East Ohio Street site. Jeffrey Ackerman, the national managing director of CBRE’s private capital group, who was involved last year in the sale of the Alcoa Business Services Center close to the North Shore, said the T extension to the North Shore is coming in an already-tight office market, and the added connection will help stoke demand. Continental, in conjunction with the Steelers and the Pirates, is proposing to build 40,000 square-feet of first-floor entertainment and restaurant space as part of the new two-story development. The second floor would be devoted to office space. On Thursday, Nakama, a chain of Japanese restaurants, completed a lease agreement to open a second Pittsburgh location in the former Masonic Hall beside the Garden Theater, said Craig Totino, a principal of Collaborative Ventures, one of the developers. Just shy of an acre and ringed by young trees, a lawn of new grass officially became Washburn Square Park in Marshall-Shadeland at a ceremony Monday on Bartold Street. A 4.3-acre lot of mud and weeds that occupied Manchester's northern portal for five years is now on the way to becoming Columbus Square, a 31-home development whose first model home was opened to the public Thursday during a ceremony on Juniata Street. Last week, Brightwood Civic Group cut the ribbon at 1407 Woodland Avenue in Brightwood, marking the first step in the Woodland Avenue Revitalization Project. The Port Authority of Allegheny County has started to take its $523.4 million North Shore Connector project for a months-long test drive. Neighbors across the street from the old German church on Rhine Street in Spring Hill say they have been watching the roof from their porches, wondering how it made it through another winter... ...Not even a mile away, down at Madison Avenue and Tripoli Street in East Deutschtown, another old German church -- originally Imanuel Evangelist, built in 1859 -- has a happier story. The Pittsburgh Urban Redevelopment Authority this afternoon approved moving forward with the sale of a collection of vacant North Side properties that includes the now-closed Garden Theater. Allegheny City Development Group plans to develop the site for retail, office and residential use for $17.5 million. The Central Northside Neighborhood Council (CNNC) announces that the innovative facade improvements project along Central Northside’s Federal Street can now move forward, thanks to the dedication of CNNC volunteers and the generosity of Duquesne Light and the URA. After nearly 90 years in the North Side, Holy Trinity Greek Orthodox Church is closing, but its move to new quarters in the North Hills will trigger the rejuvenation of another Pittsburgh congregation. Some North Side groups will profit from the Rivers Casino without setting foot inside. The Northside Leadership Conference is awarding more than $500,000 for 11 projects designed to improve the area. A Hyatt Place opened here on the North Shore, the result of a joint venture between RockBridge Capital, LLC and Continental Real Estate Companies. Development has been spurred by construction of PNC Park, Heinz Field and $65 million in utility and road work.